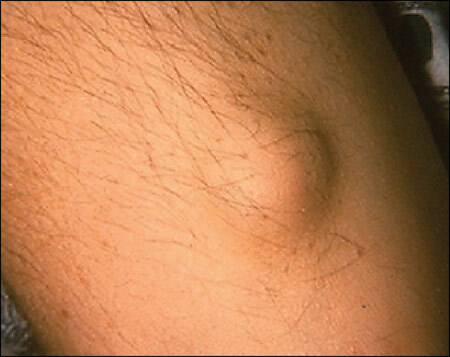 A subcutaneous nodule refers to a firm lump under a person’s skin. Subcutaneous nodules are lumps under the skin, often caused due to an infection or inflammation. The lump under the skin may be firmly attached to it or freely moveable if you press your finger over it. The lump can be tender, soft, firm or painful. A subcutaneous nodule can also cause skin changes, such as colour changes of the overlying skin on the lump. This post on subcutaneous nodules and associated signs, symptoms, causes and treatment is for learning purposes only. If you wish to learn to recognize and manage issues related to infections, subcutaneous nodules and fever’s enrol in workplace approved first aid and CPR classes. A person will be diagnosed with subcutaneous nodules by first conducting a physical examination. Treatment for lump under the skin depends on the cause of the lump. Subcutaneous nodules may sometimes go away without treatment. Subcutaneous nodules may occur as a result of an infection or inflammation caused by an underlying condition. Treatment options prescribed by the doctor may include antibiotics and corticosteroid medications. Surgery may be required for severe cases. To learn more about subcutaneous nodules, fever’s and infections sign up for workplace approved first aid and CPR training. You have already voted for this post. I have had a hard knot at the bottom of my left rib cage for several years now. I have been to doctor after doctor. It is very sore to the touch, and sometimes feels as if it is swelling around it pushing the rib cage out, causing moderate to severe pain. I am now under the care of a Rheumatologist, have been diagnosed with connective tissue disorder. Due to blood work results. I have the livido reticularis. And just recently had vein surgery, due to pelvic variscosities. They have me on prednisone, and methotrexate. Seems to help somewhat. but they are still not concerned with the painful knot in my side, that only get’s worse with activity. Several doctors have dismissed it as being calcium buildup. But why does it cause me so much pain?? ?